This 'family portrait' shows a composite of images of Jupiter, including it's Great Red Spot, and its four largest moons. 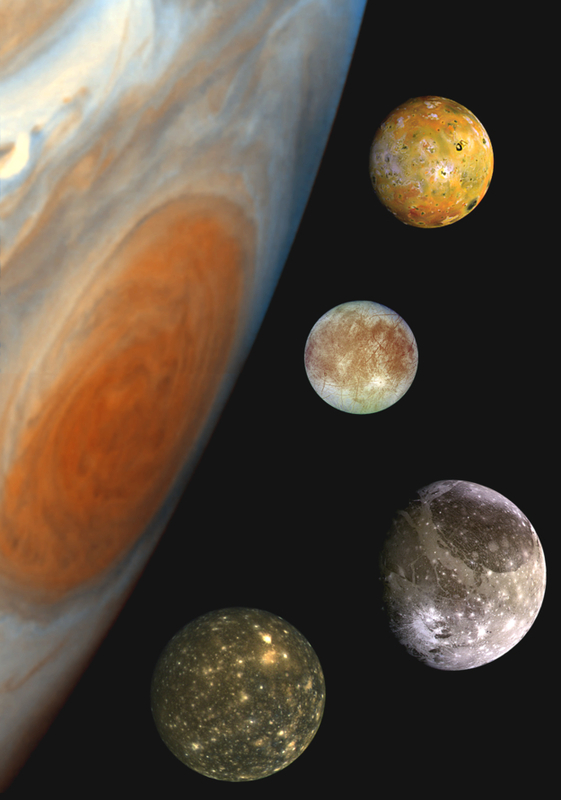 From top to bottom, the moons are Io, Europa, Ganymede and Callisto. Europa is almost the same size as Earth's moon, while Ganymede, the largest moon in the Solar System, is larger than planet Mercury. While Io is a volcanically active world, Europa, Ganymede and Callisto are icy, and may have oceans of liquid water under their crusts. Europa in particular may even harbour a habitable environment. Jupiter and its large icy moons will provide a key focus for ESA's JUICE mission. The spacecraft will tour the Jovian system for about three-and-a-half years, including flybys of the moons. It will also enter orbit around Ganymede, the first time any moon beyond our own has been orbited by a spacecraft. The images of Jupiter, Io, Europa and Ganymede were taken by NASA's Galileo probe in 1996, while the Callisto image is from the 1979 flyby of Voyager.